Every financial services firm understands the importance of data. More is better. Sooner is better. Accessing it, understanding it, and taking advantage of it before the competition is better. In the mid-2000s, Financial Services was the first industry to strongly adopt data virtualization as a disruptive, new technology for accessing and integrating more data, faster and more easily than ever before. Buy and sell side groups at the largest institutions led the charge, followed soon after by risk management and compliance units. The leading mutual fund providers, along with hedge funds, led the next wave of adoption. In recent years, commercial banks and insurers have accelerated their use of data virtualization. And today, analyst firms such as Gartner, Inc. and Forrester project continued data virtualization adoption for both first-time use at new firms and expanded deployments at existing sites. 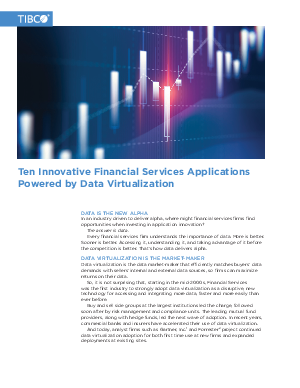 This whitepaper provides 10 examples of TIBCO Data Virtualization enabled applications for several business lines and functions.